Chinese | English Welcome to Goldsione Group Ltd.
First, the frozen water bag should first melt, and then clean to dry, do not directly clean the direct drying, and first melt and then dry, this is to extend the service life. Second, in the volume when the first use of warm water scrub, and then use soap to wash, must not use acid-base chemicals for washing, and then drying collection. Third, if it is stained with stains, to use toothpaste or detergent for cleaning, if not PVC, PVC coated layflat water hose care and maintenance that can use hot water bubble about. PVC coated water has long been widely used in various fields of irrigation, and its unique material and good practicality in the consumer market has been very popular. Its unique processing technology and in the irrigation industry has played an irreplaceable role, it has been since the emergence of hot, but the use of a long time or let it appear wear. The outer layer of polyester is made of polyester yarn, polyester filament and polypropylene filament, and the lining is used to analyze the diversity of PVC coated layflat water hose. 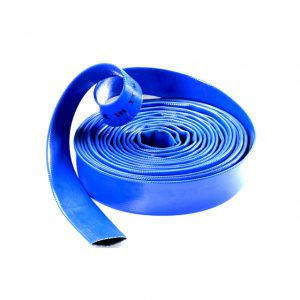 PVC layflat layflat water hose is widely used in fire fighting to transmit water or foam mixture Liquid for a fire hose, with a high pressure, wear resistance, mildew resistant, durable; coating close, smooth, no leakage, water flow resistance, flow; tube soft, can be bent Diego, free to move, easy to use; not subject to terrain conditions, all available, all seasons. The scope of application of the product is very wide, including agricultural production, as irrigation equipment, garden cultivation, farmland production, barren hills greening, ecological forest management. The next article：What are the anti-aging measures for LAY FLAT HOSE ?